Lying in the shadow of Mt. Rainier, Seattle is the hub of the Pacific Northwest. A haven of transportation and innovation, the Emerald City is also home to the snazziest-looking baseball team in the nation. And the Mariners’ glistening home formerly known as Safeco Field, is a lively environment to behold America’s pastime. 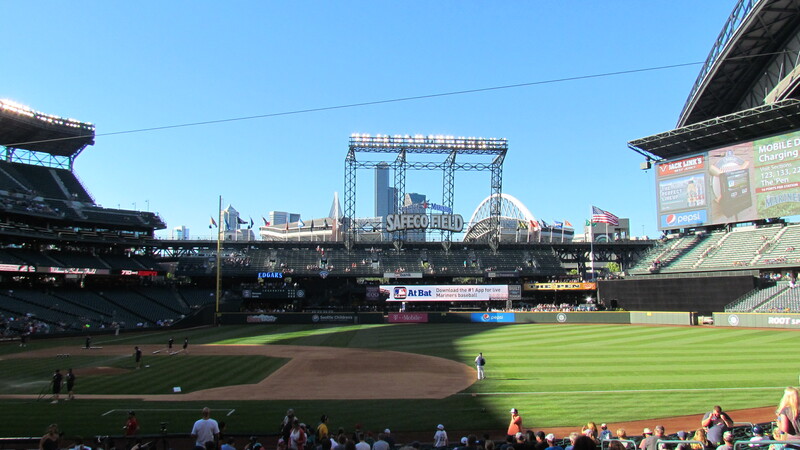 I visited Seattle with my family this past July and attended two Mariners games at T-Mobile Park, which opened in 1999. 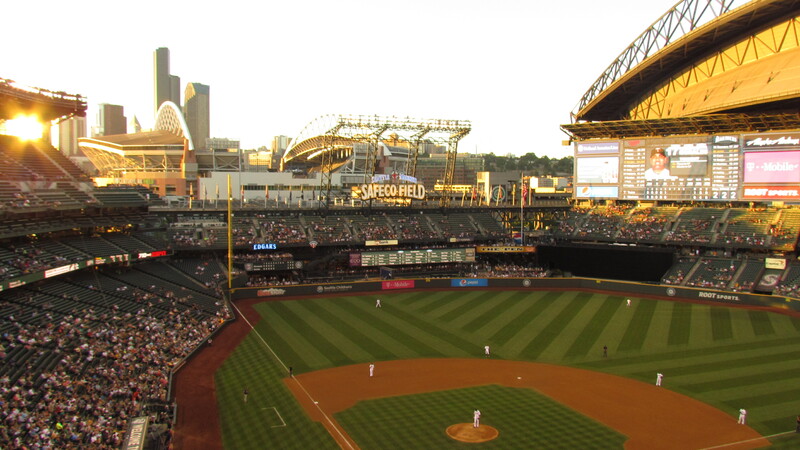 The ballpark is situated south of downtown next to CenturyLink Field (home of the Seattle Seahawks) in an up-and-coming sports district. 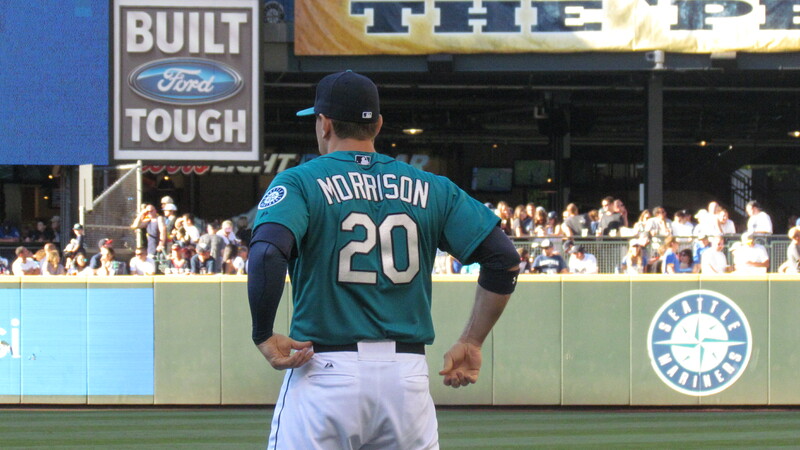 Here is my analysis of the seating chart and tips for attending an M’s game. The ticket values that I’ve written are estimates or information from last year since the Mariners have not yet released 2015 single game prices. 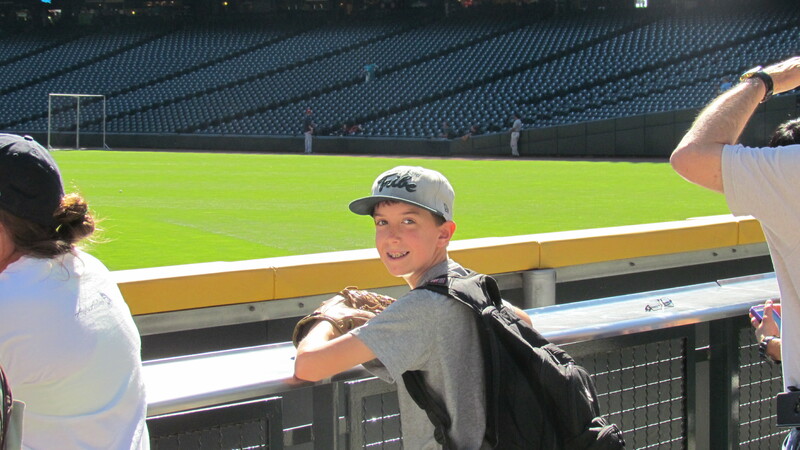 While it does have its quirks, Safeco Field was an exciting place to watch baseball and I ranked it my second favorite venue–right behind PETCO Park in San Diego. I found that Mariners tickets were much pricier than what I had been used to in the east (venues like Nationals Park and Turner Field are cheap places to watch baseball). 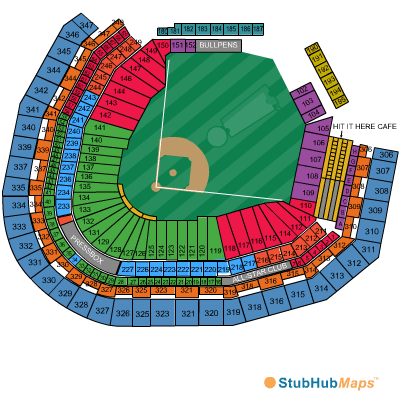 So I looked for a good value when buying tickets for the family, knowing that seat upgrading would likely be a viable option, after all it had worked for me at Fenway Park. You’ll notice the sections in purple in the lower level of right field. 108 is the second one from the foul line. When I was in that area during batting practice, the glare from the sun was intense. The sun sets along the third base line, which caused me to lose almost every fly ball hit towards me in right field during BP. In the middle innings after the sun has retreated, the glare is not bad. However, for clear days during the summer I would avoid seats in this area. If for some reason you know the roof will be in use or it’s an overcast day, these seats are perfectly fine. Like I said, expect the $30 range on StubHub, anything much higher than that for a regular season game is just not worth the trouble. Directly above (and behind) those lower right field sections is the optimistically named “Hit-it-Here Cafe.” Due to its sheer distance from home plate, only a handful of home runs over the season’s course ever reach the windows of the eatery, much less land in the seating for any of the fans to enjoy. I never ventured up there, but I’ve read that the food is sub-par and not worth the $45 value of the ticket. The ticket does, however, come with an $18 food voucher. So if you’re planning to eat that much during the game, I guess it’s a $27 ticket for an indoor seating area in high right field. I’m not here to deter, but that’s just not how I like to experience baseball. Also, the sun would be in your sightline. Moving around the foul pole along the right field line are the sections in red. The angle of these seats reduces the glare, but they are still in the sun for the initial parts of an evening game. On the left field side, sections 142-150, the sun would not be a factor. Face value on these tickets range around $50, but if you use StubHub expect a $15~ price reduction. Foul balls down here are sparse, just like at any stadium. But if it’s empty enough on a weeknight, you might be in luck. This is a good area for seat upgrading. I noticed that the ushers on the right field/first base side of the park were lenient about fans entering an exiting throughout the games, very seldom checking tickets. My parents sat on the left field side throughout the first game and reported that the usher they encountered was much more strict. I don’t know if this will remain unchanged for next season, but last year it seemed like the right side was the place to be if you plan to sit in an area other than your ticketed section. I’m also not here to encourage questionable behavior, but you get the hint. I spent both my games in the green sections 119 and 120. The upper thirds of these sections as well as those colored in red are covered by the overhang of the second deck. If you’re worried about the sun, this provides nice shade, especially during day games I presume. Also, before the game many of the Mariners warm up in the outfield grass in front of 118 and 119. So if you’re looking for a pregame autograph or souvenir, it’s a good place to camp out. I did not have any close calls with fouls in this region, but the closer to home plate you get the higher the chances are that a ball will wind up flying your way. As you can see, the 128-133 region is the closest to the plate. I always like to sit at an angle to the action, on either side of the plate. It provides better depth perception while being in better foul ball territory. Remember, the closer to home plate you sit, the higher the expected ticket price. I will say, however, that I was able to freely roam throughout these sections in the first game to take pictures from different angles. I never stuck around long enough to talk to be suspected by an usher. Move at your own risk. Face value of the outer parts of the green sections is in the $50-60 range, all depending on location. From what I recall, face value closer to home plate approached $90. StubHub wasn’t immensely better, so I’d advise buying within budget and then moving before the game. One of the park’s most unique traits is that there is almost no traditional seating in lower left field. Instead, the ‘Pen party area dominates that side of the stadium on the field level. Both bullpens run parallel to the warning track, swallowing up most homers by right-handed hitters. There is a standing room section behind the bullpens, which provides an opportunity to interact with pitchers before the game, but is good for little else. In left-center field, a large, flat concrete swath allows fans to stand right up against the outfield wall. However, the sheer distance this section is from the plate is not conducive to catching home runs. Even in batting practice, few flies land out there. For cheap beers before the game and a fun fan atmosphere, the ‘Pen is the place to be. Check the Mariners website for promotional details about the ‘Pen. For the 2014 season, they had half-priced beers for a few hours before first pitch. But if there’s anything for which I am worth nothing when it comes to baseball fandom, it’s beer. Because of the party zone on field level, the only place to sit and watch the game in left field is from up above (save two mini sections by the foul pole). There’s not much here besides possibly a decent view. The sun sets behind the third base/left field line, so depending on the seat’s proximity to the line, shade will vary. It’s high up, so home run chances are slim to none. Maybe Nelson Cruz will put one up there this year, but do not count on snagging anything. The 300 and 400 sections of T-Mobile Park are nothing spectacular. I also did not spend any game time in the club level, so I cannot provide any insightful information. What I can promise is a nice view from Lookout Landing, a modest platform of the upper deck in the deepest left field corner. 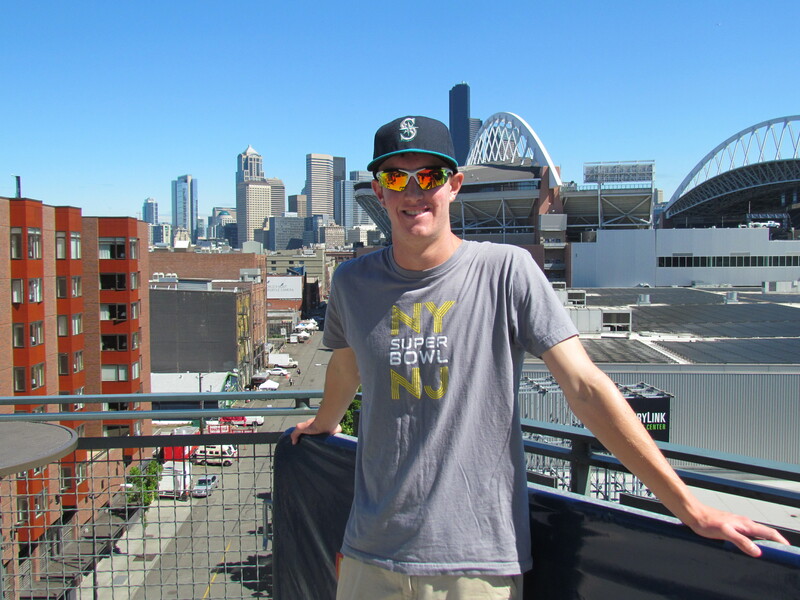 It provides interesting sight lines of the Seattle’s skyline, the harbor, and neighboring CenturyLink Field. From Lookout Landing, you can also see directly down into the bullpens and the stands below. It’s a perfect picture spot and a location any fan should visit on a Seattle baseball trip to juxtapose the fantastic sport with a unique city. It’s worth noting that T-Mobile Park does have a roof, so on damp days the fans can stay comfortable. But it is purely a retractable roof rather than an indoor-outdoor stadium. The park is still open air regardless of roof usage, meaning you should dress for the temperature regardless. There you have it–a rundown of the best ballpark north of the 47th parallel (also the only one). My only gripe about Seattle is that it’s incredibly far from the nearest MLB city. Oakland is the closest, and it’s nearly a 12-hour drive. But that also purifies Seattle’s baseball culture as fans won’t spill out of neighboring cities to come root for opposing teams. In fact, the only influx of opposing fans that Seattle sees is when Toronto comes to town each season. Why do Blue Jays fans flock to Edgar Martinez Drive? Because Canada is only a 2-hour drive from Seattle. And since there’s only one Canadian baseball team, I guess all Canadians are Blue Jays fans. Washington became the 42nd United State in 1889. T-Mobile Park is the farthest-north MLB stadium. The Space Needle was build for the 1962 World’s Fair, and was supposed to predict what homes might be like in 50 years’ time. In 2007, the American Institute of Architects came out with a list of Americans’ 150 favorite structures. 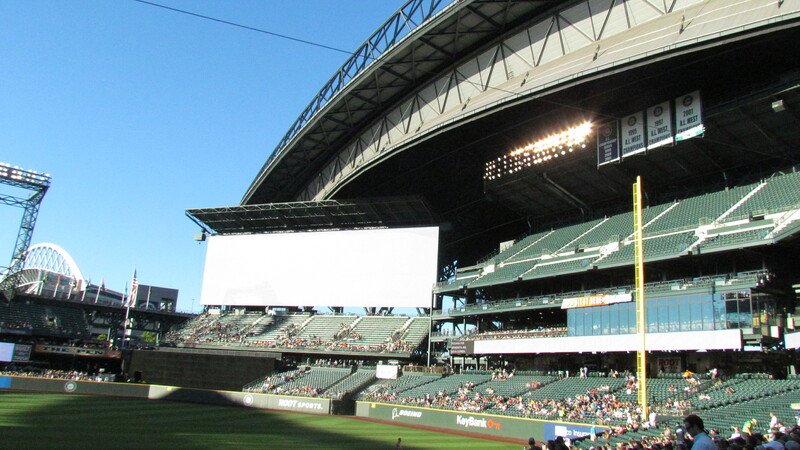 Two Seattle buildings made the list: Seattle Central Library and then-Safeco Field. I am going in a week and a half to watch them play the Astros, was wondering if any seats would be able to see Mt. Rainier from them if it was a clear enough day? Sorry, Ozzie, I’ve been away all month. I hope you enjoyed your Seattle Trip. When I was there, it was clear pretty much every day and Mt. 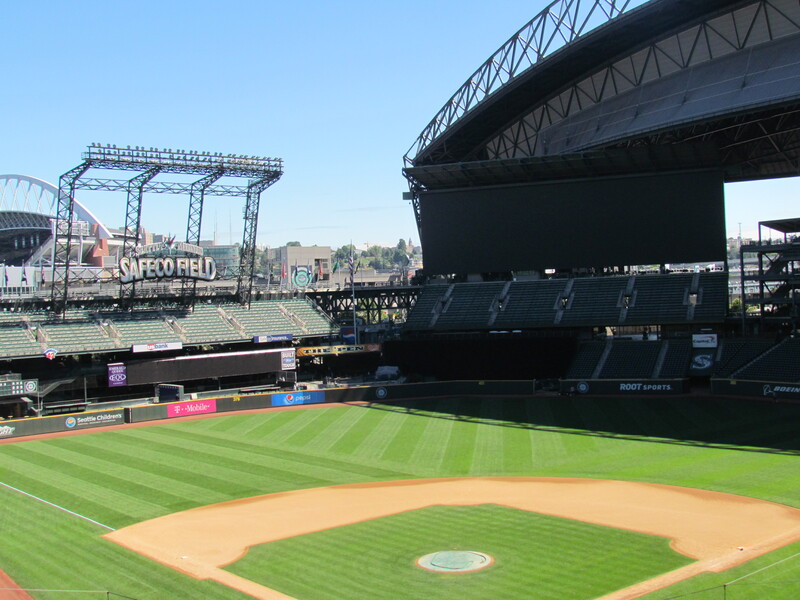 Rainier is visible from any unobstructed area, so I’m sure you could see it from the 300 level of Safeco. Question-do you need a special ticket to access The Pen or can you just go with your regular game ticket? Both before and during the game you can access it with any ticket, as far as I know. The porch area is standing room only and from the looks of it gets pretty crowded during the game. You nailed it in two visits. But prices are through the rolling roof since you came out West 4 years ago. The salaries of the pros are making even an occasional game sitting in the bleachers unaffordable in this economy. MLB’s great, if you can afford it. Hi Raven, thanks for the update! 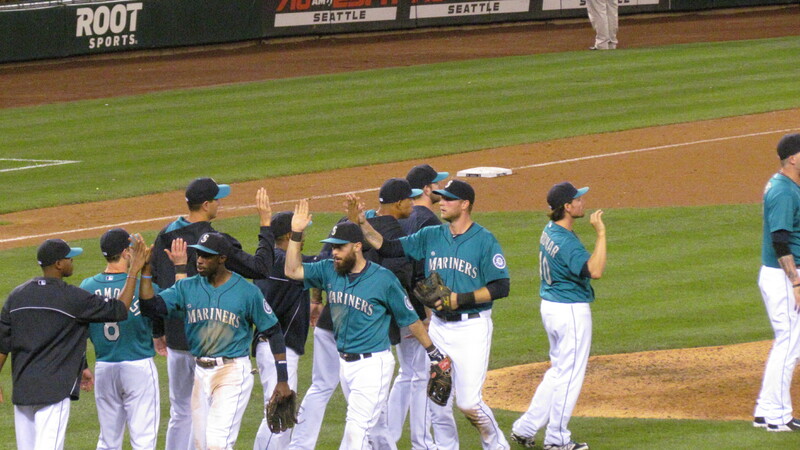 Hopefully you can find some off-market tickets for cheap so you can enjoy Mariners baseball!